Pure Coffee Blog: Win a Baratza Coffee Grinder! Do you bleed for your local espresso shop? Do you spend all of your free time patronizing a particular coffeehouse? 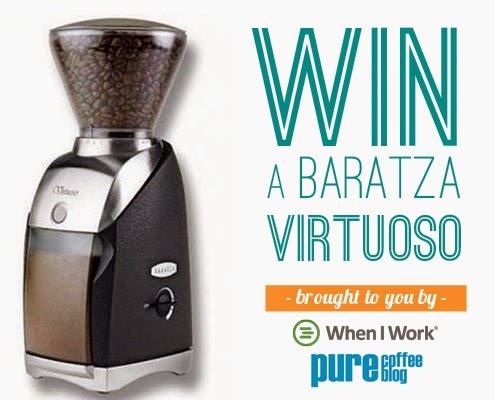 In the spirit of good will to all humans, we have teamed up with the fine people of When I Work to host a contest for one fortunate soul to win a Baratza Virtuoso Conical Burr Coffee Grinder (check it out here on Prima's website)! All that you need to do to enter is the name of your favorite coffeehouse! One of the things we aim to do here at the Pure Coffee Blog is to mine out great coffee establishments, and now's the time to give your favorite coffee business some limelight! Simply fill out the form below and submit it (one form submission per person) and then you MUST confirm your entry via an email that will be sent to your email address provided (NOTE: check your spam folder; it will be an email from "Pure Coffee Blog"). To get a bonus entry, send a picture of your favorite coffeehouse (one that you have permission to use) to contest.purecoffee@gmail.com . We ask that you stay away from national coffeehouse chains (aka a place that has more than 30 locations), as it complicates things. The contest goes until January 19th, 2015! After we've selected the winner and the winner's favorite coffeehouse, we will definitely release some of the other coffeehouses nominated! - To Enter: Beginning on December 18, 2014, interested parties (the “entrant”) may enter online by visiting http://www.purecoffeeblog.com/2014/12/winabaratza.html, then by completing the entry registration form (which includes full name, email address and favorite coffee establishment) and then confirming the subscription in a message sent to the entrant's email. Each entrant may receive one bonus entry by submitting a picture of the same coffee establishment named in the entry form (note that entrant must have ownership or permission to use picture) to contest.purecoffee@gmail.com . We ask that all coffeehouses nominated as the entrant's favorite not be a part of a national chain (a national chain is defined in this case as any coffee establishment with more than 30 physical locations). We also require that the coffeehouse submitted is an actual existing business that is still in operation (aka no coffeehouse shout outs from a place that shut its doors forever in 1985). If such places as described above are submitted, the entrant may be contacted (though this is not promised) and asked to revise their pick. Failure to submit a correct coffee establishment or to revise said pick could result in the entrant's submission being rendered null and void. - Sponsor (Pure Coffee Blog and When I Work) is not responsible for entries not received due to electronic or technical reasons beyond Sponsor's reasonable control. Limit ONE single form entry per person regardless of method of entry (aka entering the same person with different physical or email addresses is not ok). Entries submitted in violation of the “Win a Baratza Coffee Grinder Official Rules and Stuff", including multiple entries, will be void. All entries become the property of Pure Coffee Blog and will not be returned. All entries must be received by 11:00:00 PM EST on January 19, 2015 the official end date of the Sweepstakes. - Eligibility: This sweepstakes is only open to legal residents of the 50 United States and the District of Columbia who are 18 years of age and older as of date of entry. Void where prohibited and/or restricted by law. Employees (and their immediate family members) of Pure Coffee Blog and When I Work (the “Sponsor”), their affiliates, divisions, related companies, advertising and promotional agencies and any other entity directly associated with this Sweepstakes are not eligible to enter. This sweepstakes is subject to all federal, state, provincial, and local U.S. laws. - Prize Drawing: One winner will be randomly selected approximately upon January 20, 2015 from all eligible entries received. The winner will be notified by email within 2 days of the drawing with details on how to claim their prize. To claim a prize, winner must sign and return an Affidavit of Eligibility and Liability/Publicity Release (except where prohibited) within 3 days of notification. If winner does not comply, the prize will be forfeited and an alternate winner may be selected, at Sponsor’s sole discretion. Odds of winning will depend on the number of eligible entries received. - Prize is (1) Baratza Virtuoso Conical Burr Coffee Grinder from Prima Coffee (https://prima-coffee.com/equipment/baratza/virtuoso) which will be shipped via Ground delivery free of charge to the winner to their place of residence within the US and Canada (except where prohibited). Grinder is subject to availability and shipping may be delayed due to availability. - Terms/Conditions: In the event of a dispute regarding the identity of the person submitting an entry, the entry will be deemed to be submitted by the person in whose name the e-mail account is registered. By claiming a prize, winner agrees that the Sponsor, and their officers, employees, shareholders, affiliates, agents, and advertising and promotional agencies, do not have any liability whatsoever for any injuries, losses or damages of any kind related to participation in this sweepstakes, or from acceptance or use of the prize. Acceptance of the prize shall constitute the winner's agreement that the Sponsor or their agent(s) may use and/or display the winner's name, picture (if applicable), entry information and/or prize information, without limitation, for promotional purposes, without further consideration, except where prohibited by law. If due to a printing, production or other error, more prizes are claimed than are intended to be awarded, the intended prizes will be awarded in a random drawing from among all verified and validated prize claims received for that prize level. In no event will more than the stated number of prizes be awarded. All issues and questions concerning the construction, validity, interpretation and enforceability of these Official Rules shall be governed by the laws of the State of New Jersey. Any legal proceedings arising out of this Sweepstakes or relating to these Official Rules shall be instituted only in the federal or state courts located in Gloucester County, NJ. In the event of an emergency as deemed by the Sponsor, the contest can be cancelled at any time, in which case the prize will be awarded to no one and all pictures submitted to contest.purecoffee@gmail.com will be deleted. - Taxes: All taxes on prizes (if applicable) are the sole responsibility of the winner. Prizes are not transferable/assignable. No cash alternative to prize is offered and no substitutions are allowed, except at the sole discretion of Sponsor. - No Purchase Necessary. If you’re interested in becoming a sponsor for the Pure Coffee Blog after this contest is over, shoot Bill an email at bill.purecoffee@gmail.com). Great contest! Baratza Virtuoso is good, currently I am looking for something similar. In http://www.coffeegrinderworld.com/baratza-virtuozo-coffee-grinder/ they say that if Baratza Virtuoso can produce some static though. Do you agree with that? I just got my Baratza Vario 886 this is a terrific grinder, which I have been using every day for the last three months.